A recent Gujarat government report has identified Bharuch in Central Gujarat as the most hazard-prone district where what are called Major Accident Hazards (MAHs) can take place compared to the rest of Gujarat. The report, titled “Gujarat State Chemical Disaster Management Plan”, which has just been released, says that in Gujarat a total of 1,730 hazard-prone units have been identified, out of which 313 are in Bharuch, followed by Ahmedabad (287), Vadodara (261), Surat (165), and Valsad (137).Of the total number of industrial units with chemical hazard, Bharuch has the highest number of MAH units (75), followed by Vadodara (65), Kutch (35), Valsad (30), Ahmedabad (29), and Surat (26). 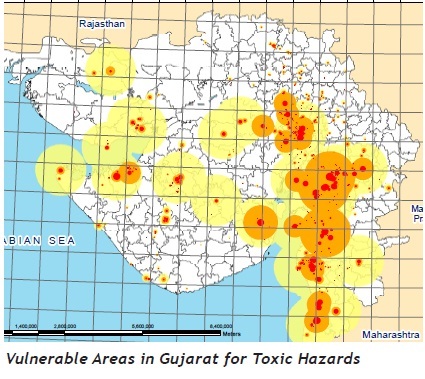 This makes two of Gujarat’s districts – Bharuch and Vadodara – to fall under the category of being “highly hazardous”, followed by six districts falling under the next “hazardous” category – Ahmedabad, Jamnagar, Kutch, Rajkot, Surat and Rajkot, and Anand, Bhavnagar, Gandhinagar, Kheda, Mehsana, Panchmahals and Porbandar falling under the “less hazardous” category. The report says that if MAH units are highly concentrated in eight districts, the situation becomes dangerous for most of Gujarat because except for a handful – Banaskathna, Patan, Surendranagar, Tapi, Narmada, and Dangs – all other districts have MAH units in some numbers. While a moderate accident in these units could lead to up to 10 human fatalities and 100, immediate evacuation of up to 2,000 people, and a loss of property worth US dollars 100,000 to 1,000,000, a major accident can lead to up to 100 deaths and 300 injuries, requiring evacuation of up to 20,000 people, and an economic loss of US dollars 1,000,000 to 10,000,000. In a worst case scenario, the report warns, these units could lead to “more than 100 potential human fatalities and 300 plus injuries”, requiring “protective actions for a significant population of more than 20,000”, widespread and/ or persistent contamination of one or more environmental media with long-term remediation or need for outside resources”, more than US dollars 10,000,000 in property or economic damages, and major impact on public confidence in government with widespread disruptions of social stability”. The average ranking of Gujarat on a scale of 10 for several major indicators -- such as environment and health, public health and safety, public outreach and education, emergency medical services, management of dead, mass care, planning, communication, situational awareness and response to disasters, security and protective actions – ranges anywhere between 5.8 (communications) and 4.4 (environmental health). Worse, the agency which is the watchdog of environment in the state, Gujarat Pollution Control Board’s ranking for planning is a pitiable 0.7, for communications 1.6, for response to safety and health 1.3, for security and protective actions 0.6, public outreach and education 2.0, and emergency public information 2.7. Its overall ranking is a mere 3.6. Pointing towards utter shortage of fire stations in Gujarat, the report says, as against the requirement of 514, just about 183 exist. The situation is particularly back in major cities which face chemical disaster. Thus, in Ahmedabad, as against the requirement of 48 fire stations, 19 exist; in Bharuch, as against the requirement of 15 fire stations, just five exist; in Surat, as against the requirement of 40, only 15 exist; in Rajkot as against the requirement of 38, just 13 exist, and in Vadodara, as against the requirement of 25, just about 12 exist.